Through 92 years of living, Solomon Epstein has had a myriad of changes – city to suburban living, army and civilian life, radio repairman to clothing executive, and the loss of his beloved wife, Molly. But he's had one constant in his life and he's not about to give it up any time soon. Solomon is a nationally rated table tennis player and each week he grabs his racket and logs in a few hours. He's a regular, has been for years, at the Leonia Table Tennis Club and continues to find it "exhilarating to play a match, even if I lose," he said. Solomon credits Holy Name Medical Center's physical rehabilitation specialists with helping him continue his passion. An injury and side effects from a medication almost made him put down his racket permanently but some physical therapy sessions had him right back at the table. "They're a wonderful group over there, and they did a fantastic job," Solomon said from his Englewood Cliffs home. "They cured me, and I'm so grateful." Physical therapists at Holy Name have expertise in working with geriatric patients, and create programs that include strengthening exercises for orthopedic conditions as well as specific movements to improve balance, said Jason Kavountzis, Director of Rehabilitation Services. "We work to get patients back to their level of functioning before the injury, regardless of age," Kavountzis said. "In Solomon's case, he played a large role in his recovery by doing all his exercises at home and participating fully in the program." 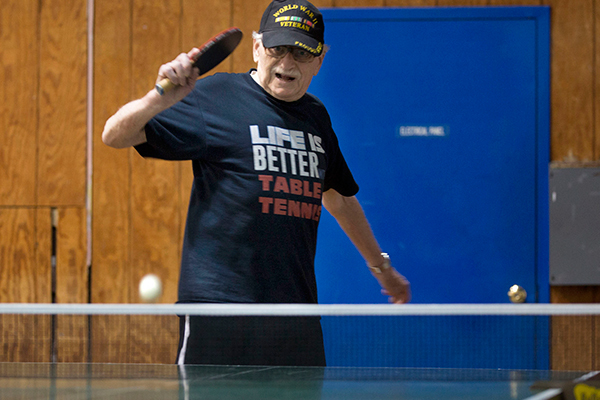 An Army veteran, Solomon played table tennis throughout his time in the service. He began when he was 13 in the Lower Eastside of Manhattan, after his mother dissuaded him from playing other sports that might cause injuries. He bought his first racket for 50 cents, a far cry from the one he now has that was $140. From his job as a radio repairman to a career in the clothing industry, his marriage to Molly – his high school sweetheart – and moving to different homes in North Jersey, he never stopped competing. He became a member of an international table tennis association and has won more than his fair share of trophies. "My whole life – I've carried my racket everywhere," he said. "I played while I was working and then after I retired I travelled to Europe three times and made a list of all the international table tennis clubs so I could play there." But several years ago, he developed pain in his shoulder – from his rotator cuff. "You know, you're constantly moving that arm and all that use really affected my shoulder," he said. "But I didn't have surgery – just went to physical therapy, and they are so good at what they do that now I'm as good as new." More recently, he was experiencing some pain in his back. Once again, he headed to Holy Name for some physical therapy. After some sessions and switching to a different blood-thinning medication, which was contributing to the discomfort, he was pain-free. "Table tennis has kept me in good shape my whole life – you are always moving in different directions – and psychologically it's very beneficial because I can block everything out," Solomon said. "My wife died in 2014 and I have to tell you I'm miserable without her. But when I'm playing, I just concentrate on the game and I can almost forget for a little while."